Australian authorities have jailed a Sri Lankan man who threatened to detonate a bomb on a Malaysia Airlines flight in May of last year. The Airbus A330 was carrying 337 passengers and crew at the time of the incident and they had to endure a very traumatic experience, which continued even after the plane landed as police delayed boarding. Manodh Marks, 26, a passenger on flight MH128 heading to Kuala Lumpur from Melbourne, caused the crew to turn back to Melbourne after he tried to access the cockpit to hijack the plane. He was tackled by other passengers who bound his hands with cable ties. However, despite the threats, Marks was later found not to be carrying explosives and was under the influence of drugs. Marks will be deported after serving a maximum sentence of 12 years, for which he should serve a minimum of 9 years. Judge Michael McInerney told the County Court of Victoria on Thursday, "The passengers and crew certainly were not only concerned but convinced, that you were indeed in possession of a bomb,". The court in Australia heard that Marks had been released from a psychiatric facility on the day of the incident. He says he had taken crystal methamphetamine, on the way to the airport and shortly after the flight took off, the student brandished two black items - later identified as a battery pack and portable speaker complete with flashing lights. Marks told the crew "I have a bomb with me," and "I want to talk to the captain. I want to talk to the pilot. Don't come near me. I want to destroy this aircraft. I will destroy this plane." 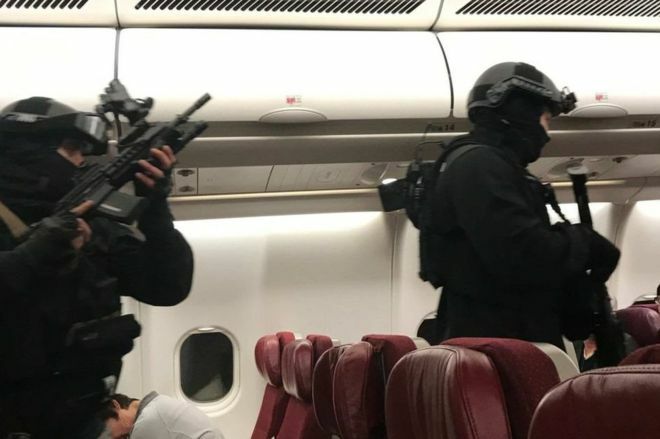 The Australian police had been heavily criticised for taking more than an hour to board the jet, they cited the belief that it was a terrorist incident rather than a case of a person with a mental disturbance for taking more than an hour to detain then man and let the passengers off the aircraft.